The North Island of New Zealand is, to a large extent, situated on top of a super volcano, the size and the threat of which is similar to Yellowstone. 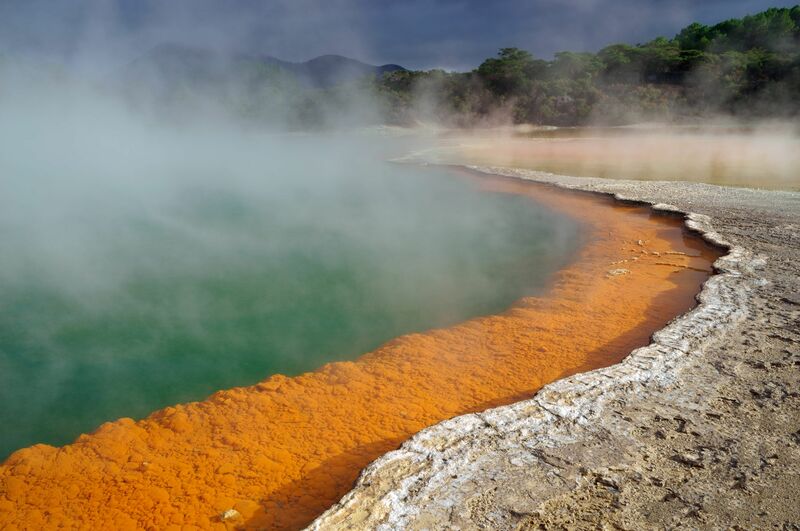 As a result there are many similar features such as bubbling mud, geysers, and thermal pools, some with striking colours. Besides this, there are many fumaroles releasing hydrogen sulfide and there are several good-size volcanoes, such as Mount Taranaki, Mount Tongariro and Mount Doom. The vibrant orange in this image is due to the minerals antimony and arsenic. The colour is not enhanced in Photoshop. The Ingredients that help this image are the clear leading line, the high impact colour and the very unusual nature of the subject matter. Camera on tripod; Sony @7R with Zeiss Vario-Tessar 24-70 mm zoom. At f22.